If you’ve ever looked at an advertisement for the island of Santorini Greece, chances are you’ve seen it. 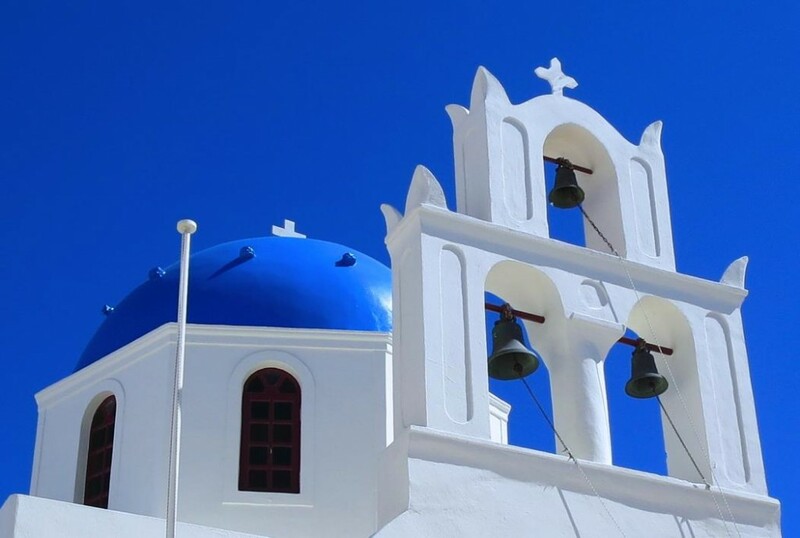 The iconic blue domed church that perfectly matches the blue sky with a backdrop of Santorini’s caldera in the Aegean Sea. You know the one. For most people, viewing that picture brings delightful visions of an idyllic Greek vacation, dressed in a pressed linen dress, sipping wine with a handsome stranger. For me, seeing this picture brings on murderous thoughts of tossing my favorite digital camera into the wind and never taking another picture again. 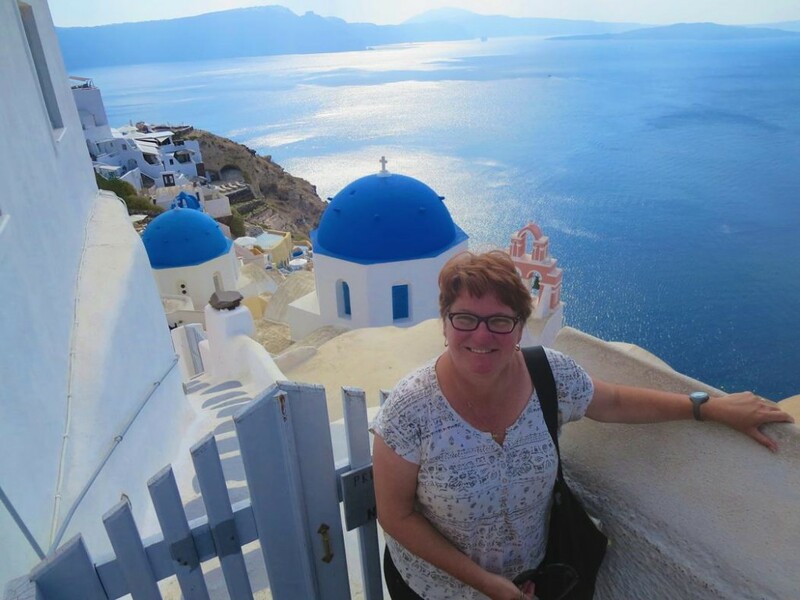 Finding the blue domed church in Santorini eluded me for many years! You see, I’ve always wanted to take “that picture” myself. 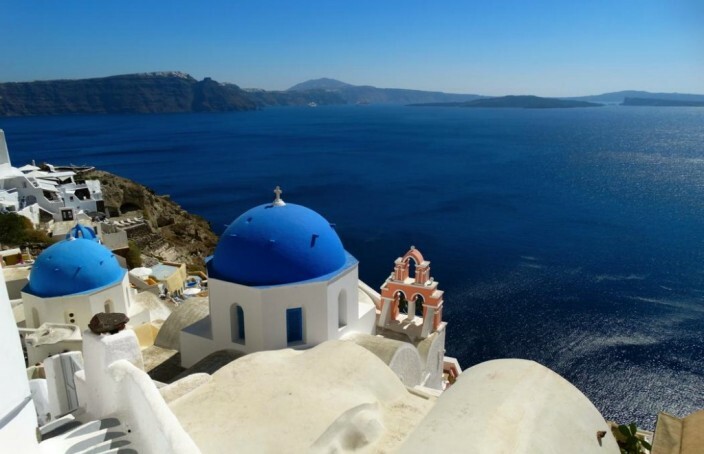 The blue domed church in Oia, Santorini would be my photographic masterpiece. I was certain of it. The blue domed church photo would be the pièce d’résistance of the thousands of photos I’ve ever taken…my most famous Instagram moment…my profile picture on Facebook. This one picture meant everything. We’d only visited Santorini once before in 2009 on a cruise stopover for a few hours. One of the cruise excursions included a Greek Photography walk around the island of Santorini. I was SO excited. This was it. I was going to get “THE SHOT”. I think I even dreamed about finding the blue domed church the night before we landed in Santorini. Our photography walk took us to some gorgeous places. 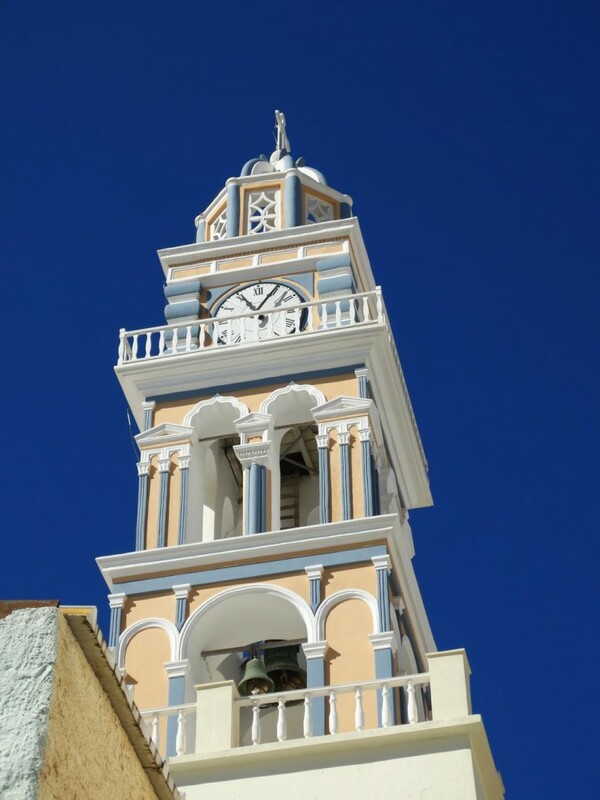 Greek island churches where the sun played beautifully with cheerfully tolling bells. Doors that led to nowhere. Skies so blue it hurt the eyes. So much incredible loveliness…but I barely saw it. I was looking for the iconic blue domed church from all of the travel brochures. 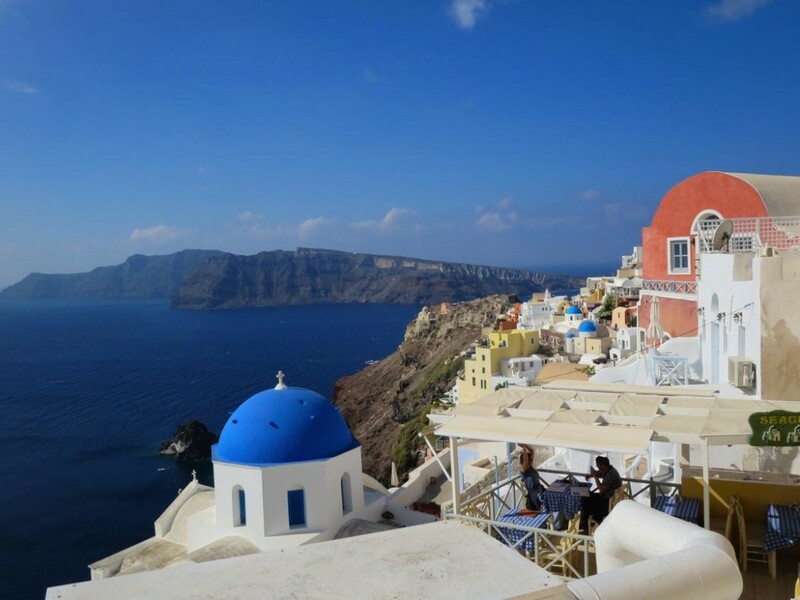 Oia, Santorini – Beautiful, but not the right church! With great sadness, our photography tour guide told us the blue domed church I yearned for was in another town, far away and we wouldn’t be seeing it that day. I was totally devastated. The wine didn’t taste good that night and all of those wonderful pictures I’d taken that day seemed dull and unappealing. We headed back home to the United States and every single time I’d see that beautiful picture of the blue domed church in brochures or on other travel sites, I’d feel the same stab of disappointment because I hadn’t gotten THE SHOT. A blue dome! Getting closer! Fast forward to early October, 2014. We’ve come to Greece early for the Travel Bloggers Exchange Conference in Athens. 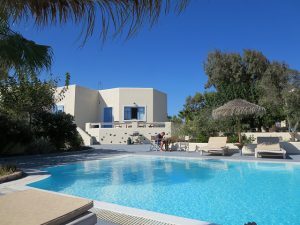 We have a few weeks to spend visiting the Greek Islands of Naxos, Paros, Mykonos, Santorini and catching up with friends. Woo HOO!! My island nemesis is on the list and this time I’m not taking ANY chances. We booked for a week at a gorgeous (and not very expensive) home we found in Santorini on AirBnB and I brought all of my cameras, so I’ll have plenty of options to capture the perfect shot. 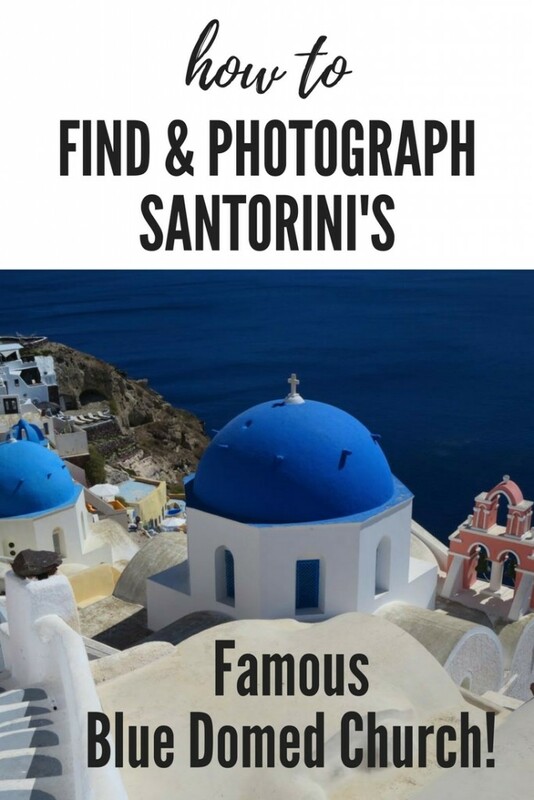 I’m researching online to find exactly where the blue domed church in Santorini is located. And I’m coming up with nothing concrete…nothing helpful at all. I found several blogs detailing hikes and best spots for a romantic evening, but not exactly where to find the blue domed church. Fira town? Imerovigli? Pyrgos? Oia village? The Church is in Oia Greece! Finding the blue domed church had become an obsession. I’d almost given up. Perhaps it just wasn’t my destiny to get this particular picture. 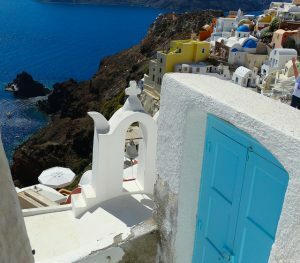 Finally, I find a post that points me to Oia Greece. We’re exploring the village of Oia, on the northwest side of Santorini. I see blue domed churches everywhere! However, the angle isn’t right. All the domes I can see are high up with no way to shoot down on them. So my friends and I start looking. Turning down alley after alley. It’s now become a competition. Throngs of tourists must be looking at us as though we’ve lost our minds. “No, it’s not down there. Let’s try the next one!” We’d run from alley to alley. Then the incredible happens. I hear a shout from down an alley I almost didn’t bother going down. “I think I found it! Come look!” It was right there! “THE SHOT!” The blue domed church on Santorini on a picture-perfect day! Wow! What luck! Did I charge my batteries? Yes! Bring the right filters? No, those I left on the nightstand. Nevermind, we were there! I must have taken 100 shots. I wanted every single nuance of the moment to be captured forever. This was my happy place. I’d found it at last! HERE IT IS!!! The blue domed church on Santorini! My friends practically had to drag me away. Only the promise of a glass of wine overlooking the caldera could entice me away. But as I walked away, I clutched my camera very close, because the camera held the precious pictures. I couldn’t stop smiling…and looking at the pictures on the viewfinder over and over. I’m SO HAPPY!! I hope you get THE SHOT, too! 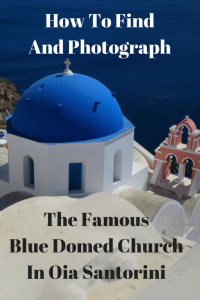 The blue domed church photo is synonymous with a perfect Greek vacation. SOOOO, would anyone else be interested in EXACTLY where to get this particular shot? I’ll share the details, because if the picture makes you half as happy as it did me, then that’s a great thing! Oia, Santorini. 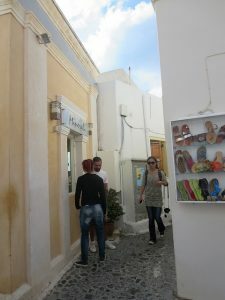 From Oia’s main square take the wide walking path – facing the caldera – on the famous Gold Street. Duck into the alley beside the Minerali jewelry store. 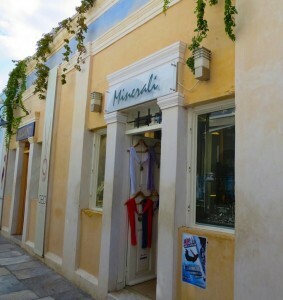 Minerali Jewelry Store…and the alley! The shot from the other side! The Alley for the Blue Domed Church Photo! Finding a place to stay in Santorini, or any of the Greek Islands, takes a little planning. 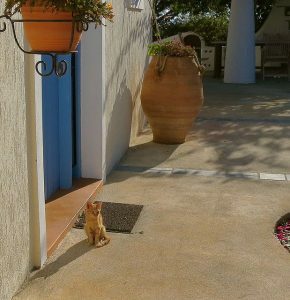 There are jaw-dropping hillside hotels where the bell-staff grabs your bags from street level and lugs them down to your room and there are quaint Mom and Pop motels where you’ll share your space with the local Greek cats. So many choices of where to stay – start your search here! One of our favorite things to do when traveling is use AirBnB to find an entire house to use as a “home base” while we’re visiting the island. We found this beauty for much less than the cost of a hotel room for 4 of us. And yes, there were a few cats in the neighborhood! It had a gorgeous pool and was only steps from the beach! Use this link for $40 off your first booking with AirBnB! If you’re anything at all like me, you enjoy reading up on a destination before you visit. From ancient history of the Greek Islands to luscious guidebooks on where to find the best baklava – books are an excellent way to plan and prepare for your Greek Island vacation! Do you have a favorite book on the Greek Islands? Have you found the Blue Domed Church during your travels? Please let us know below! Some of the links above are affiliate links to products we use, enjoy, and highly recommend. We may make small commissions on these products, but there is no additional cost to you! I’m going to Greece for the second time at the end of this month and sadly won’t make it to Santorini (again!) What beautiful pictures you have and great advice for anyone seeking out this scene! Wonderful photos- make me feel like I’m in Greece. That blue! In the sky, in the sea, it’s magic. fabulous photos. 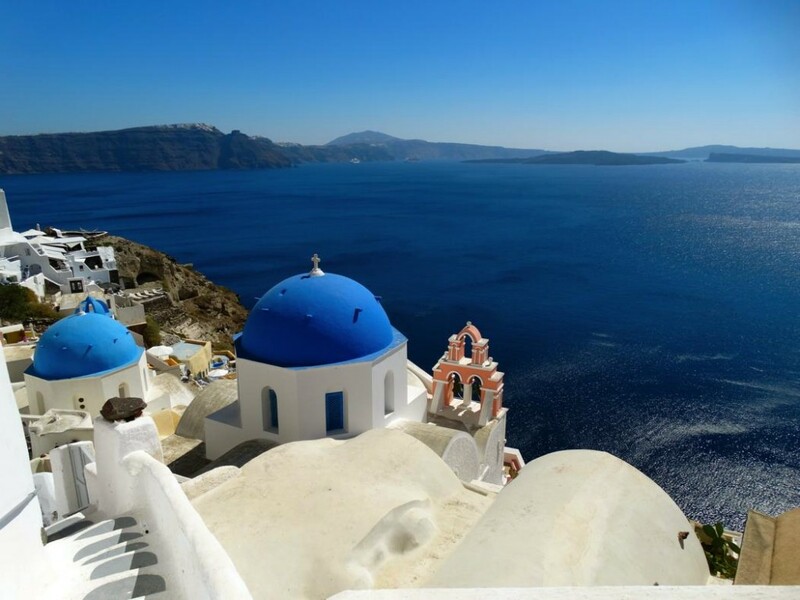 Santorini is on my wishlist and has been now for a couple of years. Next year maybe? Thanks so much Betsy! It was a really fun quest (obsession?) lol! And you definitely need to visit Greece, someday soon…it is such a beautiful and unique place. Your perseverance paid off but really I’m totally impressed with all the shots you got and can’t get over the colour of blue at sea level. I’d understand it high in the mountains but this blue is absolutely out of this world. I can’t believe the blues either…it almost hurts your eyes! But in a good way 😉 Thanks for stopping by! Thanks for taking me along! If I ever get to Santorini, I’ll know what to do. 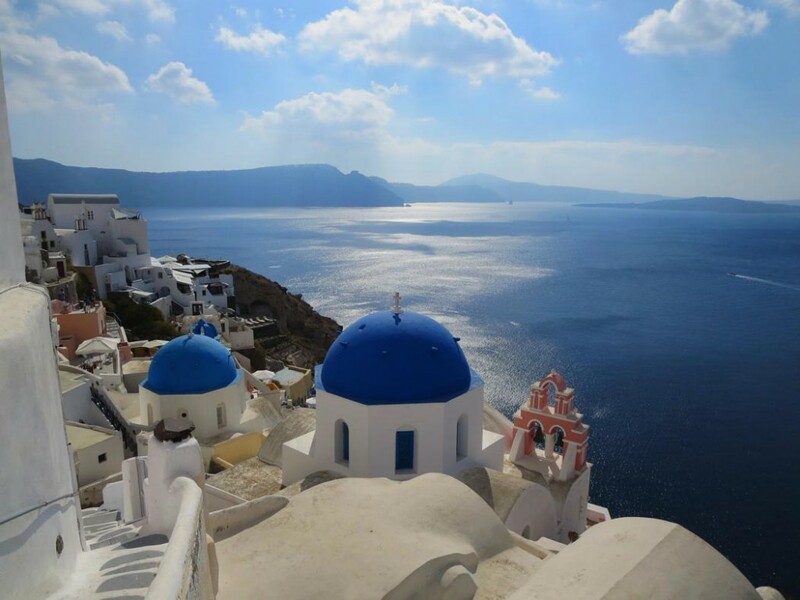 The blue and white in the Greek Ilses is so gorgeous, and you captured it wonderfully! 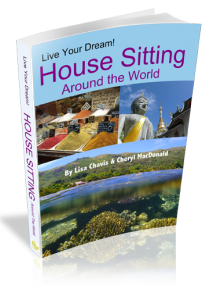 I’m heading over to TBEX – So will maybe even meet you soon! 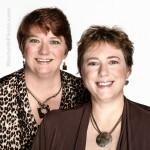 Awww – the adventure and sheer fun of the quest and what a prize! Blue is now officially my favorite color and Greece, which has long been on our travel list, has climbed over several other countries and is close to the top. Absolutely gorgeous photos that have me panting to get there! Glad you found THE blue-domed church! We think we found that one too – and have some of our own photos of it. Santorini is so beautiful, though, that there are many fabulous photos one can take :-). Hah – that is the ONE most posted destination on my Facebook page! Each time I see this I post it… and no, I haven’t been, and I had no idea it would be difficult to find, so thank you! I LOVE this church! What a great story Lisa, so glad it had a happy ending for you! It’s a great capture and i’m sure will bring you endless enjoyment thinking of what you went through to get the perfect shot. I was probably one of those who took the most common view of those blue domes. I was there for a weekend when I lived in Athens and must have taken hundreds of pictures just in Oia. Loved the old marble paths and the donkey taxi up from the harbour. Your photography is stunning! I can’t stop looking at the sky! Thank you so much for sharing this! I’m going to be going to Greece and I have dreamed of seeing this church. I appreciate this information! I din’t know finding these would be so tough! And on reading your article, I can totally understand how great a feat it must have felt. Thanks a lot for sharing the roadmap of the same. Looking fwd to visit Greece. Can you tell what month would be the best to go there? I will be in Europe from Novemeber till March. If I am not wrong, Thera is the name of the island where Santorini and Oia are. This is the only island I am planning for this time as the blue domes have really caught my eye.. and heart subsequently! Do suggest some other islands if you can where we can get such picturesque architechture. Architechture and natural sceneries are what we are looking for as my husband and I are not at all into adventure sports :P.
You are hilarious! Haha! I am going to Santorini, Greece in August for my wedding anniverary (with my husband obviously) and LITERALLY been searching for the exact spot to take this infamous Santorini post card. So glad you found the spot! Thank you! Followed your tips..I have a very similar picture to share.. Awesome! Glad you found the Blue Domed Church. The whole area is quite picturesque, but this was definitely our goal. Hi Shreena! I hope you get all the pics you’re looking for on your cruise! The other view is from a different location, possibly further down the street and I’m not sure that it’s even the same church. Best advice is to not stick to the main road (it’s always crowded with tourists anyway) but duck into the little alleys along the way. I’m sure you’ll find many more blue domed churches to photograph. Have a wonderful time! Thanks for sharing… I was out there at Oya and took the same shot in glorious sunshine at about 6pm and then again on a moonlit night about three hour later. It was just glorious. We hoped it would help people out. We searched a few times over a few visits and were finally able to get “the shot”! SO glad you found it! A great location to take in so much beauty too! We are staying just below the blue dome churches. Anyway: thanks for the help! It will make my vacation much happier! Like you, I dreamed of that shot before going to Santorini. Foolishly, I thought all houses had those roofs, not just churches. I only had a brief afternoon in Oia and had been taking photos all over the island all day. Again, foolishly only had the battery in my camera which died just before sunset. I had to catch the sunset with my phone. We spent a glorious week in Santorini and I got sooo many beautiful photos. Just not “the one”. I loved it so much there and would happily go back, although the highlight of my trip was the Monasteries of Meteora. I’d love to go back there for several days. Greece and the people of Greece are magical! Thank you, Lisa! I swear I could have written your post. We are going to Greece for a family vacation at the end of the month because I want to see that view! Dragging 16 YO triplets and my seasick husband from California to Santorini for that photo which I’ve always thought is so beautiful. I’m so happy that you posted the key to finding it. I’m so happy you posted this! I’m going to Santorini in July and I really want “that shot”!! Thank you Thank you!